In this Photoshop tutorial, Gail Edwards will transport you to the stormy seas, constructing this image from a rocky beach background, a tornado in the sky, and an elegant model. She then adds an evocative lantern, as well as it’s light and shadows. Thoughtful placements of additional color, lighting, fog, and rain bring the entire narrative together using grace and nuance. This tutorial has both a video and written component. These images were created by Shift Art members, based on Stormy Seas by Gail Edwards. Join Shift Art to show your version! 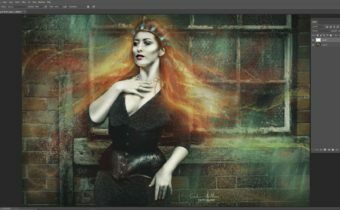 CJM Weekly Photoshop Tip #11: Screen Blend Mode! CJM Weekly Photoshop Tip #10: Backlighting! Thank you so much Gail. I learned a lot today , now to go put it into action. You are a natural teacher so patient and precise in your explanations. I look forward to more tutorials from you. Thank you so much Nancy!! You are very welcome as well! Gail, thank you so much for this tutorial!! Beautiful piece and wonderful explanation of how you put this together. Hi Gail i really enjoy your tutorials you explain ever thing in such detail and i learn so many techniques watching them , just one thing i would like to ask is the rain brushes from raw exchange are they brushes or overlays as i cant seem to find the brushes in their online store and i would really love to get some . Hope this helps, if you still can’t find them let me know. Thank you for your clear explanation of each step, which made things easy to follow.Hope to see more of your tutorials. Thank you so much Liz, I hope so too!! That is what I call step by step….thank you Gail for sharing your knowledge…. You are very welcome Mireille!! Thank you! I learned some new tricks! Now to remember them! LOL, that is the trick!! Glad you liked it! !